Want to wow your kids with a breakfast that you secretly know is healthy? Give these Quinoa Pancakes a try! 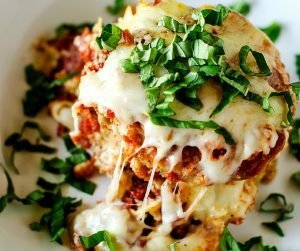 Not only will the whole family love them, but you will feel good about serving them. The recipe is gluten free with a vegan option. 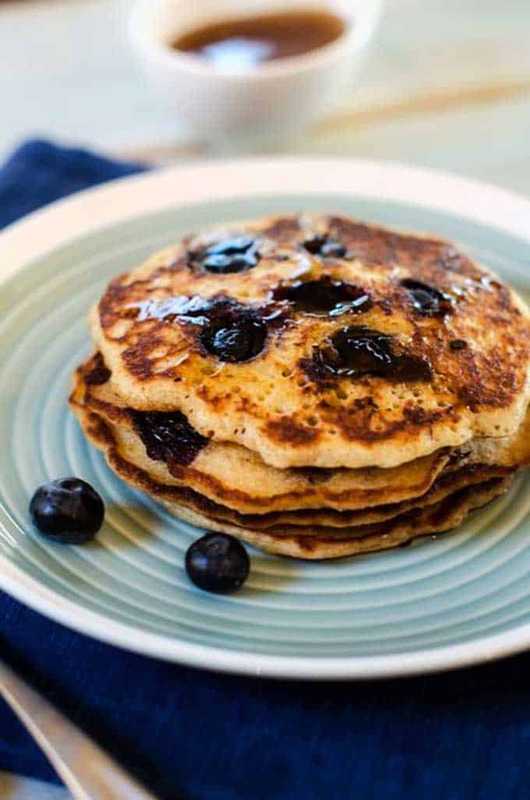 These Quinoa Flour Pancakes are a healthier alternative, with applesauce and cooked quinoa. I get a lot of questions about getting kids to eat healthy, and the truth is, this isn’t something I’ve got all figured out. As much as I love things like vegetables and quinoa, none of my kids are big fans. I’ve had different struggles with all three of them but struggles all the same. Now they have got their tween attitudes going. They know how to cook and convincing them to eat what I’ve prepared if it doesn’t sound good to them is harder than ever. That’s ok, though. I am not above a little trickery when the situation calls for it. 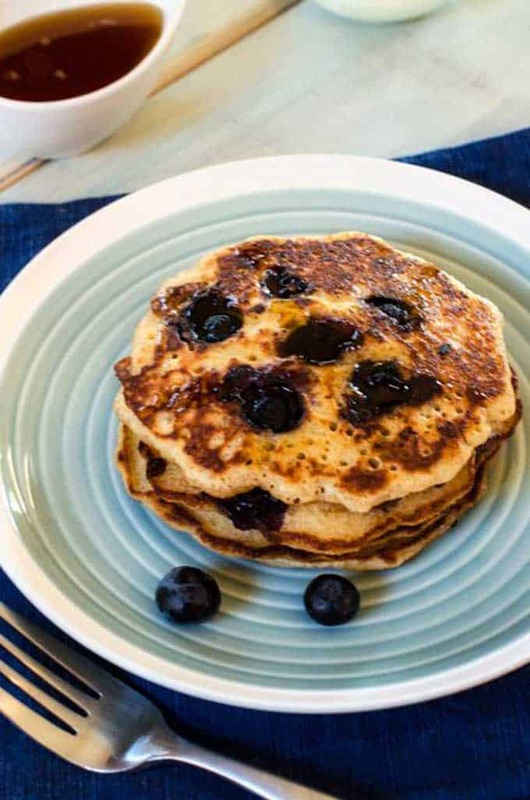 These Blueberry Quinoa Pancakes are one of the best ways I’ve found to get kids eating quinoa. I love adding quinoa to pancakes of all types because the added protein and fiber is a great way to fill you up. Plus, I tend to crash if I eat something carby and sweet in the morning. Adding quinoa prevents that. Want to wow your kids with a breakfast that you secretly know is healthy? Give these Quinoa Pancakes a try! Not only will the whole family love them, but you will feel good about serving them. 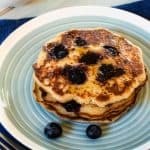 These Quinoa Flour Pancakes are a healthier pancake alternative, with applesauce and cooked quinoa. These pancakes are gluten-free with a vegan option. In a medium bowl combine flours, baking powder, sea salt and coconut palm sugar. Separate eggs. Add the yolks OR to the flax eggs to the applesauce, milk, vanilla and butter. Whisk in the dry ingredients. In a separate bowl beat egg whites until soft peaks form. You don’t want to overbeat. Add eggs to the batter and mix well. Stir in quinoa. Preheat a griddle or nonstick pan to 350. Lightly oil. Using a ¼ cup measure, drop the batter onto the warm griddle. As the batter begins to set, add in blueberries. Flip when the underside is brown and cook until browned on the other side. These pancakes are great with other fruits! Give raspberries or bananas a try. (I especially like walnuts and bananas together!) Chocolate chips are another great add-in for a special treat. Alternatively, if you prefer plain pancakes (one of my kids does), feel free to omit the add-ins. I've made these pancakes gluten-free, but if you aren't gluten-free feel free to use regular or whole wheat flour. I like to toast my quinoa flour because it mellows the taste! (I did a post on Baking with Quinoa that describes this process.) . For fluffier pancakes, don't pat them with a spatula after you flip them! This makes them denser. If you have the time, let the batter sit for 10 minutes before cooking. Make sure you wait until you see bubbles before flipping the pancakes. Whoa! 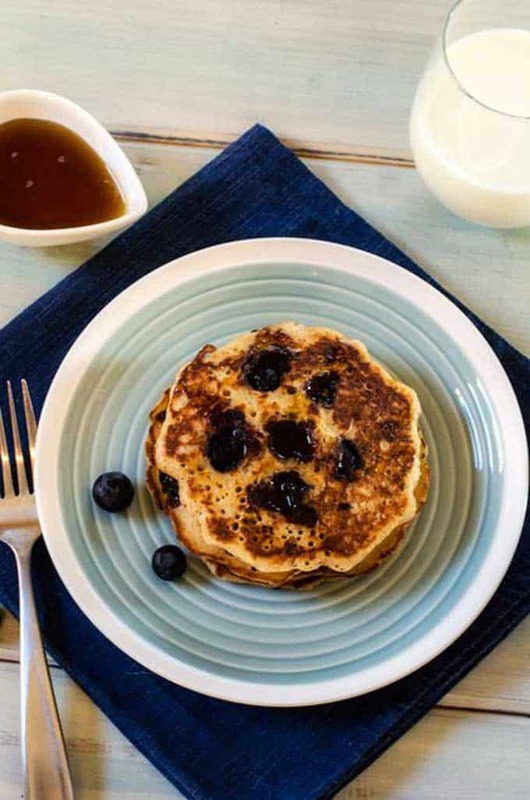 Blueberry quinoa pancakes sound delicious! Healthy, too. 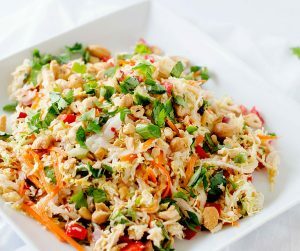 Pinning this recipe and definitely giving it a try – I can’t wait! It’s so hard to find a non-crumbly GF pancake recipe! Especially if I try to add anything like nuts or blueberries! I’m excited to try this one out! I had no idea quinoa could be used to make pancakes! How cool! I do not like to use gluten-free flour mixes since most of them are heavy on the rice flour. Would almond flour work, or do I need to find a recipe for a healthy gluten-free flour blend that I can use? Oh, and if any of your readers use reg flour, perhaps you should encourage them to at least use organic so they aren’t getting glyphosate (Round-up) in their pancakes!